Coming off a tremendous win over the Union Lady Bulldogs, Tech women’s basketball is prepared to build on the performances that led them to last year’s Women’s National Invitational Tournament finals. Although the official 2017–18 season will not begin until Nov. 10 at Appalachian State, Tech competed abroad in Italy over the summer and has begun preparation for tough competition within the Atlantic Coast Conference (ACC). 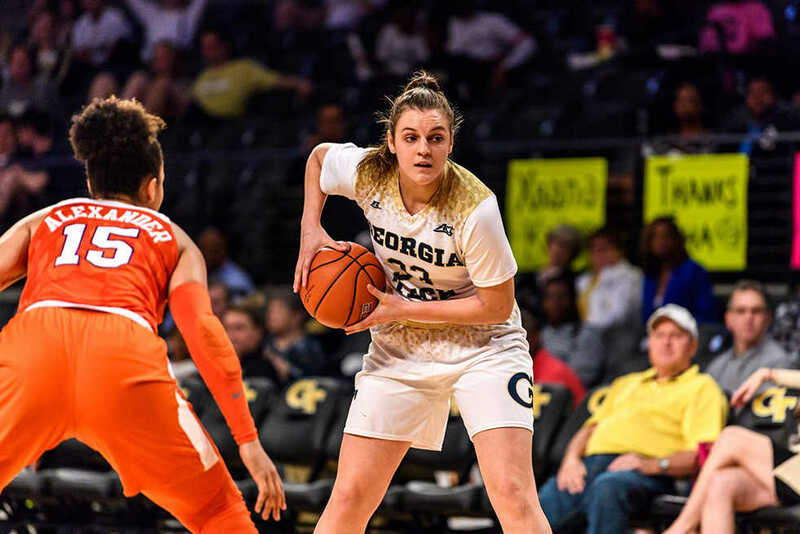 The Jackets lost four players after the 2016–17 season — Katarina Vuckovic, Cha’Ron Sweeney, Simina Avram and Chelsea Guimaraes — but are reloading with the talent of powerful freshmen and a star transfer for the new season. As head coach MaChelle Joseph enters her fifteenth season with the Jackets, she begins another season of introducing youngsters to the realm of college ball while building on her history as the all-time winningest women’s basketball coach at Tech. Four freshmen are on the move to make their mark on the court: guards Taja Cummings and Kierra Fletcher and forwards Lorela Cubaj and Daijah Jefferson were ranked as the twelfth best recruiting class in the country by ProspectsNation.com. The freshmen were praised by Joseph and their teammates for their positive attitudes and bountiful energy, as well as the accomplishments and work ethic that they bring. Taja Cummings is a 5’6” player from nearby Alpharetta with state championships from her last two years of high school under her belt. She understands that college sports are played at a quicker pace, but she is ready to attack the game along with her teammates. Kierra Fletcher, who stands at 5’9”, led her high school in Michigan to three district championships and one state championship during her junior year. Coach Joseph sees Fletcher growing into the shoes of senior Imani Tilford next season, after Tilford moves on from Tech. Lorela Cubaj is a 6’4” guard hailing from Italy with vast international playing experience, including playing time with the Italian National Team. Cubaj was ranked as the second-best international prospect by ProspectsNation.com and makes an impact with the two other Italian women who play the same position — senior Antonia Peresson and sophomore Francesca Pan. The most versatile of the new faces, Daijah Jefferson hails from Virginia and can be expected to play an essential role in the defensive portion of the Jackets’ game. Like Cubaj, Jefferson was ranked highly amongst her peers and will strive to live up to the expectations her coach and teammates hold. But Tech is more than its recruiting class. The Jackets are merely reinforcing the foundation that they built up last season in their deep postseason run. Returning for this season is the core of the Jackets’ success last season: Pan, Seniors Zaire O’Neil and Imani Tilford and Junior Kaylan Pugh each averaged nine or more points per game, and O’Neil and Pugh posted five or more rebounds per game. Pan is also the reigning ACC Freshman of the Year and looks to improve on her already stellar 2016–17 campaign. The exhibition game hosted Sunday, Nov. 5 created a positive feeling for the Jackets moving into the 2017–18 season. While the media anticipates that Tech will finish a modest No. 9 in the conference standings at the end of the season, the team’s fresh talent and cumulative experience could lead to a more impressive season than has been predicted.